Six All-Stars from the All-Ireland champions will feature against Ulster in the challenge match on 3 November. Donegal manager Jim McGuinness, Michaela's widower John McAreavey and Ulster manager Joe Kernan. DONEGAL MANAGER JIM McGUINNESS has named his strongest possible line-up for the 3 November Match for Michaela at Casement Park. The charity match, taking place for the first time in memory of Michaela McAreavey, will feature an Ulster selection, managed by Joe Kernan, up against McGuinness’ men. The Donegal team includes All-Stars such as Karl Lacey, Michael Murphy, Paul Durcan and Frank McGlynn. McGuinness said, “This is the first time that, this group of players, will take the field as All Ireland champions and we are delighted to be in this position. “We have a number of injury concerns but we will be fielding the strongest team possible. We have all been enriched to have her as part of our association, our community and this event, we hope, will remember the life, heart and soul of a beautiful woman who lost her life too soon. Ulster: Brendan McVeigh (An Dún); Ryan McCloskey (Fear Manach), Dan Gordon (An Dún), Chrissy McKaigue (Doíre); Ciaran McKeever (Ard Mhacha), Darren Hughes (Muineacháin, Captain), James Loughrey (Aontroim); Sean Cavanagh (Tír Eoghain), David Gibney (An Cabhán); Colm Cavanagh (Tír Eoghain), Mark Poland (An Dún), Joe McMahon (Tír Eoghain); Martin Penrose (Tír Eoghain), Michael McCann (Dún na nGall), Conor McManus (Muineachán). Donegal: Paul Durcan; Paddy McGrath, Eamonn McGee, Thomas McKinley; Frank McGlynn, Karl Lacey, Declan Walsh; Christy Toye, Neil Gallagher; Daniel McLaughlin, Adrian Hanlon, Ryan Bradley; Patrick Mc Brearty, Michael Murphy, David Walsh. Tickets are available www.tickets.gaa.ie, from County Boards and GAA clubs and from participating Supervalu and Centra stores nationwide. Tickets are priced at £10/€10 for adults and £5/€5 for children. 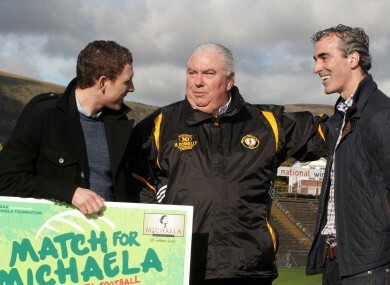 Email “Jim McGuinness names strong Donegal side to compete in Match for Michaela”. Feedback on “Jim McGuinness names strong Donegal side to compete in Match for Michaela”.